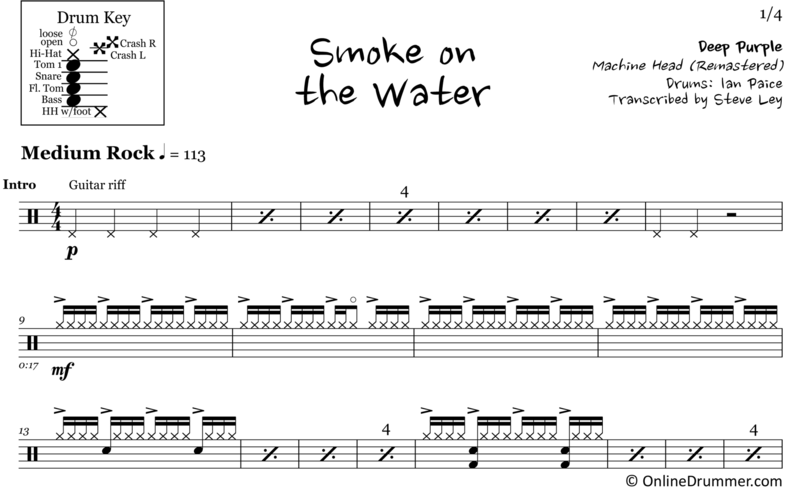 The full drum sheet music for “Smoke on the Water” by Deep Purple from the album Machine Head (1971). Often recognized for its unforgettable guitar riff, Ian Paice’s drum part to this song is perhaps equally as classic. At a reasonable 113 bpm — a tempo we can handle — this drum track will give you practice with sixteenth-note and quarter-note grooves. The drum fills feature a number of syncopated triplet and sixteenth-note patterns. A lot of fun to play!